– What do you think of Princess Martha-Louise? The Norwegian journalist was interviewing me on the banks of Lake Geneva. As a rule I refuse to answer questions that are not relevant to my work, but in this case there was a reason for his curiosity: on the dress that she had worn on her 30th birthday, the Princess had asked them to embroider the names of some people who had been important in her life – and my name was among them (my wife found the idea so good that she decided to do the same when she turned 50, sewing in one corner of her dress the credit “inspired by the Princess of Norway”). – I think she is a sensitive, delicate, intelligent person – I answered. – I had the opportunity to meet her in Oslo, when she introduced me to her husband, a writer like myself. – And there is something that I honestly fail to understand: why did the Norwegian press begin to criticize her husband’s literary work after he got married to the Princess? Before that, all his reviews were positive. It was not exactly a question, more of a provocation, because I already imagined the answer: the reviews had changed because people feel envy, the most bitter of all human sentiments. – Because he broke the Law of Jante. The Law of Jante focuses on the feeling of jealousy and envy that sometimes causes so much trouble to people like Ari Behn, the husband of Princess Martha-Louise. This is one of its negative aspects, but there is something far more dangerous. And this law is accountable for the world being manipulated in all possible manners by people who have no fear of what the others say and end up practicing the evil they desire. We have just witnessed a useless war in Iraq, which is still costing many lives; we see a huge abyss between the rich and the poor countries of the world, social injustice on all sides, unbridled violence, people being forced to give up their dreams because of unfair and cowardly attacks. Before starting the second world war, Hitler sent out several signals as to his intentions, and what encouraged him to go ahead was the knowledge that nobody would dare to defy him because of the Law of Jante. Simple: nobody said anything because the others did not say anything either. According to the dictionary: a tendency of the spirit to consider something as probable; the second of the theological virtues; expectation; supposition; probability. For the ancient Greeks: In one of the classic myths of the Creation, one of the gods, furious at the fact that Prometheus stole fire and in doing so gave men their independence, sends Pandora to marry her brother Epimetheus. Pandora brings along a box, which she is forbidden to open. However, just as happens to Eve in the Christian myth, her curiosity gets the better of her: she raises the lid to see what is inside, and at this moment all the troubles of the world spill out and spread all over the Earth. Only one thing remains inside: Hope, the only arm to combat the misfortune that has scattered throughout the world. A triple perfume rose to the sky: the incense, the perfume of Noah’s tears, and the aroma of his actions. An Arab story: The great Caliph Alrum Al-Rachid decided to build a palace that would mark the grandeur of his reign. Besides the chosen terrain stood a shack. Al-Rachid asked his minister to convince the owner – an old weaver – to sell it to be demolished. The minister tried, but without any success. Back at the palace, it was suggested that they simply expel the old man from the site. People who seek only success rarely find it, because success is not an end in itself, but a consequence. Obsession doesn’t help at all, it becomes confused as to which path to follow and ends up taking away the pleasure of living. The truly rich person is the one who is in contact with the energy of Love every second of his existence. You must have a goal in mind, but, as you go along, it costs nothing to stop now and then and enjoy the view around you. It spends most of its life on the ground, envying the birds and indignant at its fate and its shape. One day, though, Mother Nature asks the lizard to make a cocoon. The lizard is startled -it has never made a cocoon before. It thinks that it is building his tomb, and prepares to die. In desperation, it locks himself into the cocoon and awaits the end. Some days later, it finds that it has been transformed into a beautiful Butterfly. It is able to fly to the sky, and it is greatly admired. In a certain village in Umbria (Italy), there lived a man who was always bewailing his lot. He was a Christian, and found the weight of his cross too heavy to bear. One night, before going to sleep, he begged God to let him change his burden. That night he had a dream; the Lord led him to a warehouse. “Go ahead and change it,” he said. The man saw crosses of all sizes and shapes, with the names of their owners. He picked an average size cross – but when he saw the name of an old friend written on it, he left it aside. Finally, as God had permitted, he chose the smallest cross he could find. To his surprise, he saw his own name written on it. Give us this day, Lord, our daily miracle. Miracles tear away the veils and change everything, but do not let us see what lies behind the veils. They allow us to escape unharmed from the valley of the shadow of death, but do not tell us which road led us to the mountains of joy and light. They open doors that were locked with padlocks impossible to break, but they use no key. They surround the suns with planets so that they do not feel alone in the Universe and keep the planets from getting too close so that they won’t be devoured by the suns. They transform the wheat into bread through work, the grape into wine through patience, and death into life through the resurrection of dreams. Therefore, Lord, give us this day our daily miracle. And forgive us if we are not always capable of recognising it. Life is tough–we all know that. Yet, it’s also our perspective that determines whether we go through life’s trials and tribulations with a strong heart or a weak one, and whether we emerge as a warrior or as a disheartened loser. 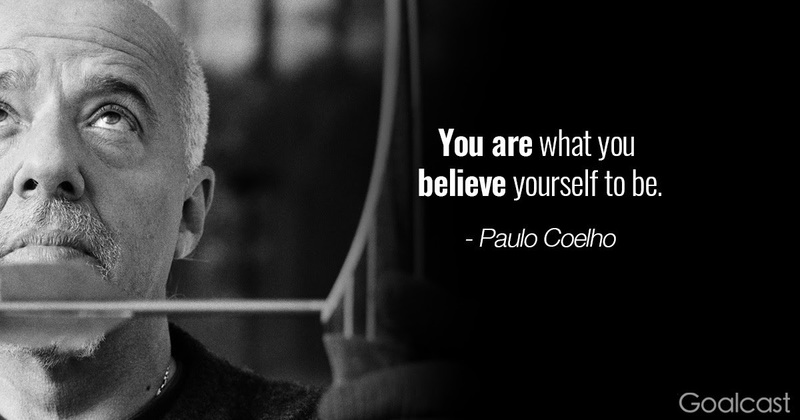 Here are 15 quotes from the famous writer, Paulo Coelho, that will help you see the silver lining behind every dark cloud in your life.